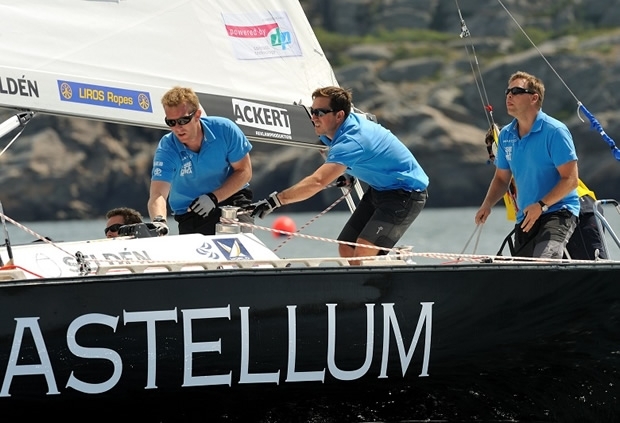 Swedish skipper Johnie Berntsson kicked off scoring at the Stena Match Cup Sweden with two wins on his home turf. Berntsson finished day one of the Stena Match Cup Sweden at the head of the leaderboard alongside Portuguese wildcard Alvaro Marinho after a short first qualifying session. Berntsson shrugged off the poor form he has shown on the opening days of the previous World Match Racing Tour events this season with a win over Danish rival Rasmus Viltoft in the first of two flights raced today on the waters of Marstrand Fjord. In a recreation of his epic win in the Quarter Finals of the Portimao Portugal Match Cup Berntsson dispatched Torvar Mirsky and his The Wave, Muscat team in his second match of the day. Marinho opened his scorecard with a win over Swedish skipper Mattias Rahm of Stena Bulk Sailing Team, but it was in his second match where he really excelled, taking down last year’s Tour star France's Mathieu Richard. Marinho led off the start line and defended the right side of the course, rounding the first mark just ahead of Richard. However the Frenchman wasn’t going to let Marinho slip away easily, reducing the gap to a few metres as the pair started the second upwind leg. As the pair traded blows up the right hand side of the course Richard appeared to get the upper hand forcing Marinho to take left thanks to a great lee bow manoeuvre, but Marinho managed to cling on to his lead to start the final run to the finish line with the slightest of margins. Despite his best efforts Richard couldn’t pass the Portuguese skipper, who snuck over the finish line first to take the win. The second qualifying session, kicking off tomorrow at 0900 local time, will see more Tour Card Holders including Tour leader Francesco Bruni and Portimao Portugal Match Cup winner Ian Williams of Team GAC Pindar hit the water for their opening matches.